It does not matter if you use crystal baskets, plates and trays as a decoration or for serving snacks, candies or fruits. In both cases you will fall in love with them. 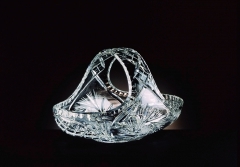 Crystal baskets, plates and trays represent the great skill of Czech glassmakers – they are manufactured with special attention on every detail that makes them beautiful, shiny and resilient. Choose the one from our various shapes in Pinwheel cut and we promise you that you will be fully satisfied.